To see the 'Schedule Summary' report, go to the tab 'Reports' -> and under 'Schedule' -> select 'Schedule Summary'. 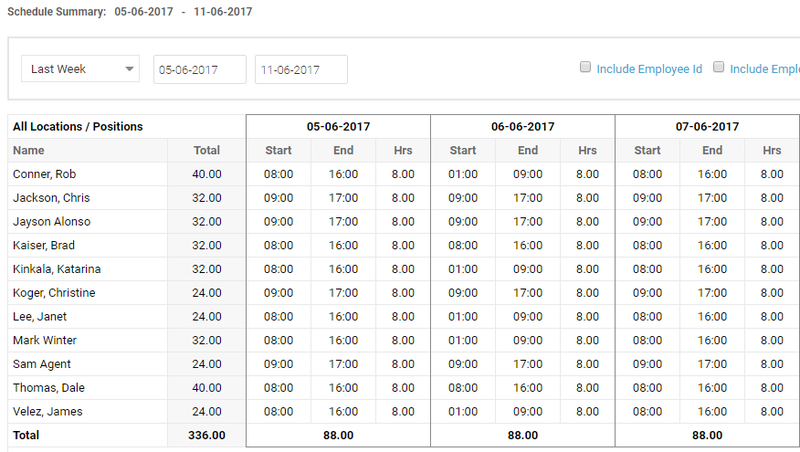 The 'Schedule Summary' is a report that will list all scheduled staff and hours per day with both start and end times of the shifts from the ShiftPlanning. This report is easily grouped by 'Location' or other filters set in the application and also includes totals for the key metrics. The report is also available in printable format or downloadable as a CSV file. You can select ‘Timeline’ or enter the specific dates in the top left corner of the window. All timeline options are held when switching between different reports. This makes reporting significantly faster when switching between report types with different options and staff selected. You can also filter the reports by 'Location', 'Position' or 'Employee' by clicking on any of the options from the drop-down menu in the top right corner. You have the option to print or export each report by clicking the options ‘Print Report’ or ‘Save asa .CSV’ on the top right. Choosing the ‘Save as a .CSV’ option will save the report in a .csv format to your computer.